When it comes to fire protection compliance, San Jose businesses and those from the South Bay Area turn to AAA Fire Protection Services. We offer a detailed list of fire sprinkler services as well as fire protection and fire suppression services. We work with businesses of all sizes and within all industries. Our smart design team blends seamlessly with your architect or design team to create a comprehensive fire sprinkler system that helps you reduce your risk of fire. 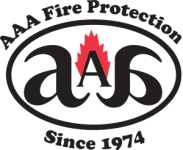 Whether you are building a brand-new building or renovating an old one, AAA Fire Protection Services understands exactly what's needed for you to comply with federal, state and local fire protection protocols. We offer fire sprinkler installation and as an ongoing service, our fire sprinklers inspections helps us detect broken or insufficient fire protection problems. When that occurs, we perform fire sprinkler repairs. Our goal is always that your entire business is protected from the risk of fire and capable of reducing the damages of fire should it occur. For more information about our services or for a personal quote, just give us a call at (800) 543-5556.